Félix Solís Avantis purchased the winery known as Castillo Mudéjar S.L. in 2005 when it was just one-year-old. The first harvest took place in 2005. This winery is characterised by its Mudejar style brickwork together with the olive tree garden and the sculptures of a musician and his muse. Furthermore, the façade’s bright orange colour never fails to impress visitors. At present, Pagos del Rey is one of the three most important wineries in Rueda. 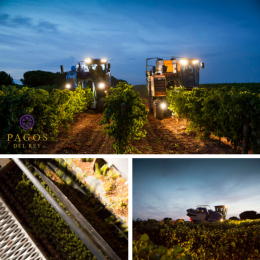 Pagos del Rey Rueda winery has been totally modernised and equipped with all the latest technologies. Along with the bottling plant it also boasts a large air conditioned storage warehouse. Analivia Rueda is made in our Pagos del Rey winery, in the province of Valladolid. The wine is made from Viura and Verdejo. Viura is a historic variety that is also known as Macabeu and Maccabéo in Roussillon in southern France, as Macabeo in much of its homeland Spain, and as Viura in the Rioja region. It has the unusual virtue of giving birth to young dry white wines, often blends, with real nerve and character. Analivia Sauvignon Blanc is made in our Pagos del Rey winery in Rueda, in the province of Valladolid. Sauvignon Blanc is an international variety originally from France that has adapted perfectly to the growing conditions in Rueda. Caño White is made from Verdejo grapes. Verdejo is an indigenous variety of grape from the Rueda region in Spain. Verdejo grapes are generally harvested at night in order to obtain this wine of intense and fruity aroma. This prevents grapes from suffering the high temperatures of September days in this region. In Spain, the indigenous Verdejo variety is a byword for a fruity, light white wine that offers real pleasure! La Camioneta Verdejo is made in our Pagos del Rey winery, located in the province of Valladolid, Rueda. Careful handling of this region’s star grape Verdejo, combined with modern wine making techniques, has resulted in a deliciously fresh and fruity dry white wine with real character and brightness. 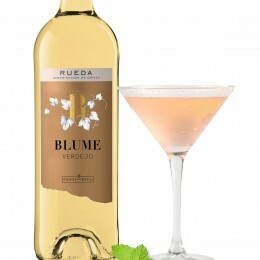 Blume Rueda is made in our Pagos del Rey winery, in Rueda, in the province of Valladolid. The wine is made from equal proportions Viura and Verdejo grapes. Viura is a historic variety that is also known as Macabeu and Maccabéo in Roussillon in southern France, as Macabeo in much of its homeland Spain, and as Viura in the Rioja region. It has the unusual virtue of giving birth to young dry white wines, often blends, with real nerve and character. Bottling line: 9,000 bottles per hour. Total storage capacity: 10,000,000 litres.